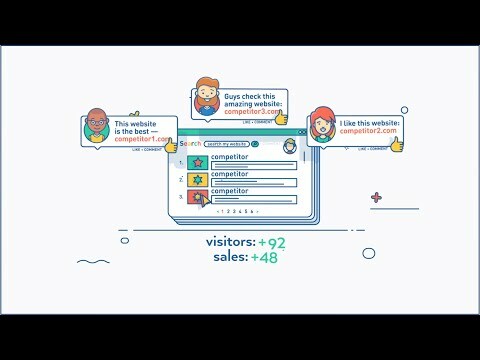 Ahrefs.com is a well-known SEO tool provider boasting the world’s largest index of live backlinks that is updated with fresh data every 15-30 minutes. Site Explorer is best known as our backlink checker. You can run a complete competitor analysis and see the websites that are linking to your competitors. Site explorer also shows you the organic keywords that a website ranks for in the Organic Keywords report. Content Explorer is a mini search engine that was made for marketers. You can discover the most popular content by searching through nearly a billion pages of content and use filters such as keyword difficulty, organic search traffic volumes, and more. Keywords Explorer helps you take your keyword research ahead of your competition. You can discover thousands of great keywords to rank for, analyze their ranking difficulty, and calculate their traffic potential, all in one easy to use tool. This tool also shows the top 10 SERPs in Google for any search query and will uncover single pages that rank for thousands of keywords as well as low-hanging keyword opportunities you can take advantage of. Rank Tracker tool lets you track both your desktop and mobile keyword rankings from virtually any location in the world (including ZIP/postal codes). This tool includes interactive graphs that track your pages in the SERPs. Rank Tracker can quickly show you whether your SEO and content marketing efforts are working, or if they’re not. Ahrefs’ Site Audit tool allows you to analyze your website for technical SEO issues and monitor its health over time. For each crawl, we search for over 100 common technical SEO issues and provide you with actionable tips so that your organic search rankings are not hindered by on-page mistakes. Ahrefs’ Alerts sends you daily, weekly, monthly, or real-time notifications on new/lost backlinks, web mentions, and keyword rankings. You can head on over to ahrefs.com to see the full toolset that we offer.